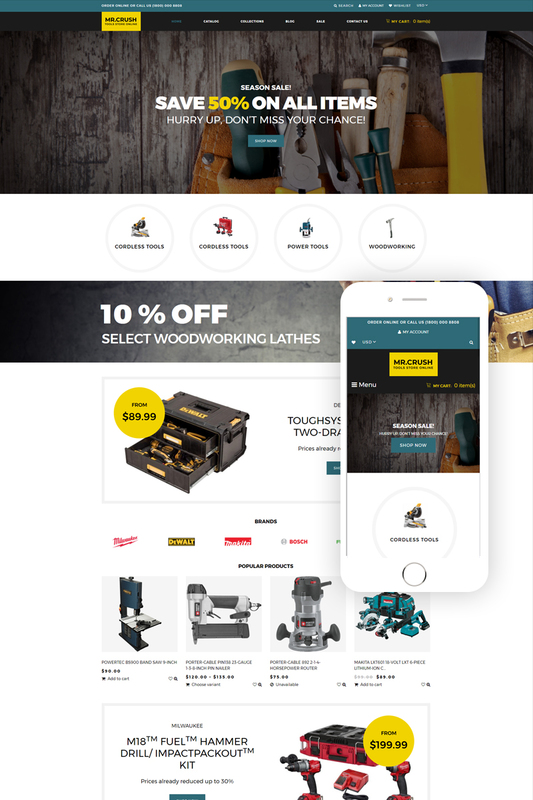 If you need a theme for your tool store then Mr. Crush is definitely what you need. Developed by professionals this Shopify theme includes all e-commerce features you may need. It has a cart, wishlist, and currency options. This Shopify theme has many prebuild pages and you can use them to sort your products and present them in the best possible way. Moreover, well-developed structure and many pre-built pages allow you to use this theme for other e-commerce projects too. For example, you can create a gadget shop, accessories store, or sell various electronic devices. Moreover, Mr. Crush is easy to edit the theme and you can do it even without coding skills. As any good e-commerce theme, it has a clean design and allows you to highlight products. You can also blog, use social options and insert video or other visual content. Mr. Crush supports high-quality visual content.